Need to resize a ton of pictures on a Mac? 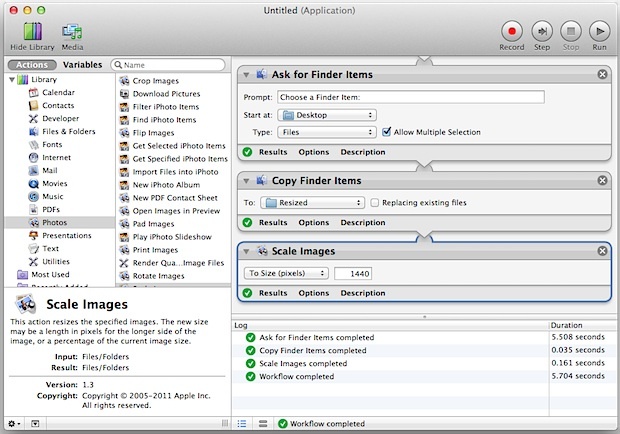 Instead of downloading a third party application or using Preview, you can use Automator to handle the entire operation, even renaming the images to indicate they have been resized to a new resolution. Automator is included in every Mac OS X installation’s /Applications/ folder and is simple to use, making it an excellent tool for repetitive tasks like this. If you’ve never used Automator before, don’t worry, we will walk through the entire process to get it working, and the result will be a simple app that resizes any images that are dragged and dropped onto it. This will build a little Mac application that has drag and drop support, the result is that files that are dropped into it will be automatically resized. Another option is to go the “Services” route instead, which adds the ‘Resize” option to the right-click contextual menus of Mac OS X. To do that, start from the first step but instead of choosing an “Application” in Automator, choose to create a “Service” instead. Save as usual, then just select multiple files in the file system, right-click the group of images, and you’ll find the new Batch Resize option, which when selected runs through the resizing process automatically. It’s that easy, so the only decision to make is whether you want it in the alternate-click menu or as a standalone app with drag and drop support. Not a fan of Automator, or would prefer another option? You can resize groups of images manually in Preview too, though it won’t be quite as automated it still handles batch processing bulk photos just fine. Also, you can tweak and resize images from the command line tool sips, which requires usage of the Terminal and thus may be considered more advanced, but it can be scripted which makes it incredibly useful as well. With so many options included natively in Mac OS X, there is really no reason to download a third party app to perform these tasks on a Mac. Automator is incredibly underused. I would suggest this would be better made as a Service though so that one could access it from the services menu. I use automator for all sorts of tasks. However, I run into issues making folder actions. Anyone create folder actions and they just don’t work or simply stop working? Replace “Find Selected Finder Items” with “Get Selected Finder Items” at the beginning of the workflow. Drop & Drag then works just fine. Anyone had the problem in lion when resizing loads of images (over 174) that automator hangs in lion? I installed Lion and went back to snow leopard (amongst other reasons eg lightroom crashing) because of this. If so, has it been resolved? I’m looking for the solution to this as well. Automator hangs up right at 174 images. I’ve seen the same issue on several threads, but no solutions. Thanks. Same here guys. App stalled out a batch at about 180 images. All my tests with fewer images worked great. How do you save it to the dock for drag-and-drop? I can only save it as an application within Automator, so I have to open Automator every time I want to resize my images. Fantastic help, btw. Thank you so, so much. You don’t need to create & have an app sitting on the desktop. With automator, you can actually define a service (not an app) under Automator (choose service when entering automator) so that when you right-click, you have a new menu (ex: “resize pic”) that does the job without having to drag & drop the pics on an annoying icon on finder desktop. In my case, I now use it to resize some chosen pics and add them straight as an attachement to an outlook 2011 msg (as the photo resize feature is badly missing under outlook). So I can right click and I have “compress and send via email” when a pic is selected. Hi Bilou, I’d really like to learn how to do this using the Right Click instead. Pray tell! Just wanted to say thanks. I’d never used Automator before. You’ve opened my eyes to a whole new world, and your instructions were terrific (high praise from a previous technical writer). Thanks so much! This was super useful!! Never used Automator before but now I’m definitely going to try it for everything!! Thanks!! I need to do this all the time; I should have thought of this earlier. I got the resize working but I wanted to add the resized files into the original folder as mentioned but no success so far. What did I do wrong? i also don’t see the option to use the variable “existing path”. you can only define another location. for now i copy the pictures or folders to my desktop, as the smaller versions will usually get thrown away anyhow. I would like to make Service to resize folder of images to network drive. But no version works as I would like. * to images were first processed then saved to target location. I do not want copy originals to target location. Simply picking up folder and create downsized version on target location without any middle stepsa like copying files somewhere. Is it possibel with Automator I need to use some other App or AppleScript? Thanks a lot…works like a magic. Incredibly useful, thank you for sharing! I created a service “Resize to 1280” that I can call by right-clicking selected in Finder. I’ve never used Automator. Sounded like a cool thing to have at hand. Too bad I’m stuck at Step 1, trying either the Application route, or the Service creation. After selecting either of those options, I hit a brick wall. Nowhere to be found, is anything named “Files and Folders” I’m seeing the usual list of items seen whenever I open a Finder window. “Automator” is displayed at upper left, indicating that it is the active app. Checked every dropdown menu up top, to right of “Automator” for “Files and Folders”. Not there, either. Tried selecting both “App…”, and “Service” followed by the “Done” button. Nothing, I never get to the multi- paned window like the image above in the instructions. You have to open the application named Automator, on a Mac, and then have Automator as the foreground application. If Automator is not the active app, you will not be able to use it to create a batch resize program for batch resizing pictures on the Mac. Launch Automator and start from there. You may want to quit other apps if you can not find the open window for Automator.